LESS IS MORE. The great jazz guitarist Howard Roberts claimed he played with 40 chords. My jazz teacher Norm Calen felt he worked with 35. This means 35 to 40 chords are at the top of the consciousness, and spring into the hand as the eyes pass over a chord chart. This does not mean Roberts and Calen could not play an Eb M9 +11 (E flat Major 9 Augment 11) if asked; it just means that instantly they would grab the ready Eb M7 (E flat Major 7), a harmonic reduction, and not keep the band waiting. I’ve never owned a book containing 5000 and some odd chords. By the time a player could make use of such a book he/she doesn’t need it; the eccentric Eb M9 +11 chord can be quickly deciphered by a player who’s taken guitar lessons covering music theory. Don’t be overwhelmed by the unnecessary. If you see yourself as a pop/rock, folk style player, you ought to know the primary chords in the guitar friendly keys totaling 8 major and 8 minor chords, a handful of 7th, minor 7th, and major 7th chords. 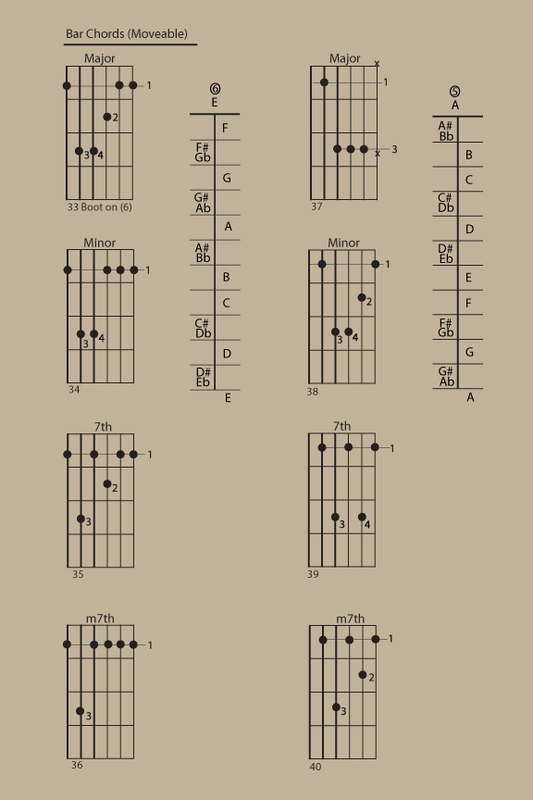 These chords you will play and play. Additionally two movable forms (bar chords) apiece of major, minor, 7th, and minor 7th, will be your devoted friends always. This above collection of 42 different forms will see you to the grave a happy person. In explanation the 40 or 35 chords claimed by Roberts and Calen are movable forms prefered by the jazz player. Each form can be played over 12 roots or pitch levels provided by our chromatic scale (a form called F on the 1st fret is called F# on the 2nd, G on the 3rd, etc…) Therefore 40×12=480 actual chords for Roberts; 420 (35 x 12) for Calen. 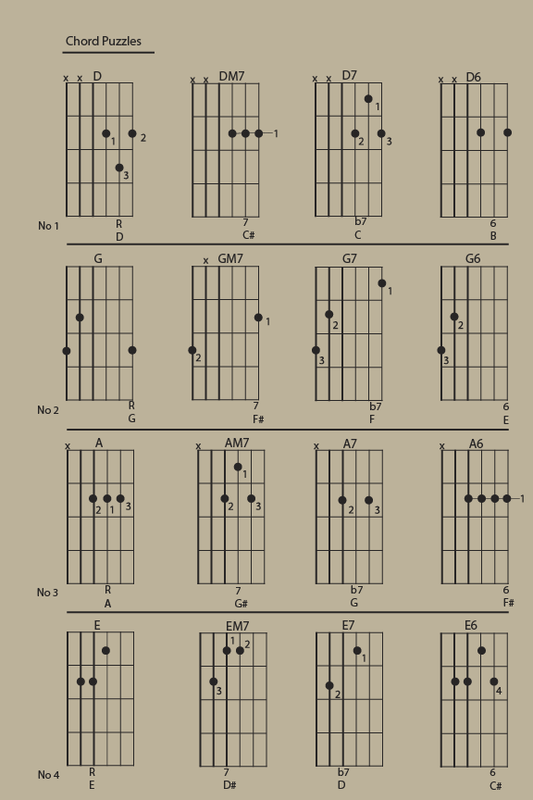 The chords recommended for the Pop/rock, folk player (“open chords” count as one and bar forms as 12) total 90 different chords (give or take), played using only 42 different forms. Learn these forms and you will have a stronger chord vocabulary than 85% of guitar players. Click below for 40 chords B Sharp Studio encourages you to know before buying a chord encyclopedia. These will allow you to play any song in the folk, pop/rock styles you’re likely to encounter. Tip: don’t know a chord? Use harmonic reduction. G13 becomes G7. Am9 becomes Am7. Don’t know E7#9? Use E7. CM9 (CMajor9) becomes CM7. Look at these Chord Puzzles. Do you see the what and why?